Creating a website for your law firm? Here are some of best options for you. 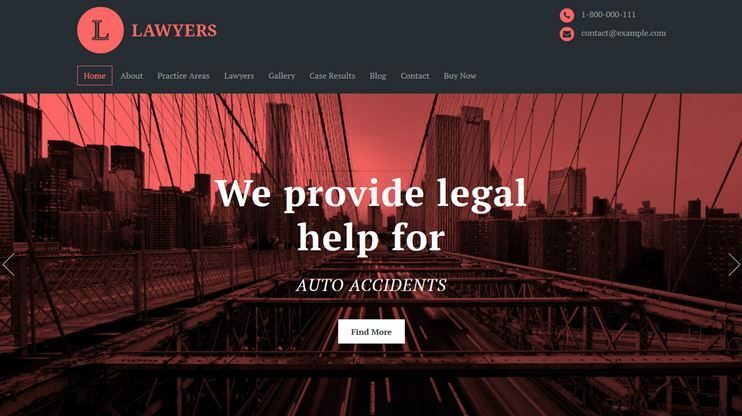 We’ve prepared this list of some of the best lawyer WordPress themes, that you can use to create your law related website. 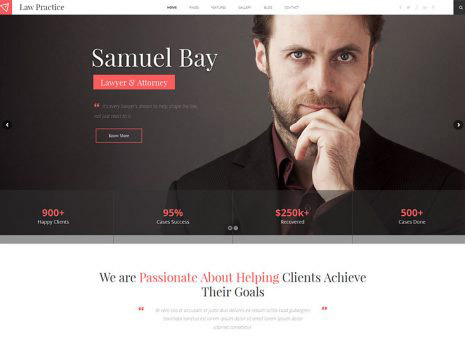 These themes can be used to create a website for private lawyers, attorneys, law firm, legal consultancy, or any such website. These themes are specially designed for the purpose. So, they already possess the required features and a purpose oriented design. With these themes, you have a ready to use design and all the required features. All you need to do is to update the theme with actual data. The best thing about these themes is that they don’t require any code tweaking at all. Instead, there are intuitive options you can use to build up your site. So, have a close look and select the best Lawyer WordPress theme of 2018 for yourself. So get this theme to create your portfolio website in 2018. Lawyers as the name says - is a lawyer WordPress theme. The theme has everything to that is needed for a website for law companies, legal advisers, officers, lawyers or attorneys. With Lawyers, you have special pages for displaying team, case and results and practice subjects. The home page of the theme is totally widgetized, so you can re-establish it according to your requirements. With Lawyers you have 12 page templates and header and footer areas. Lawyers present you with dedicated post types to let you display your cases, practice areas and team. It is SEO friendly too. 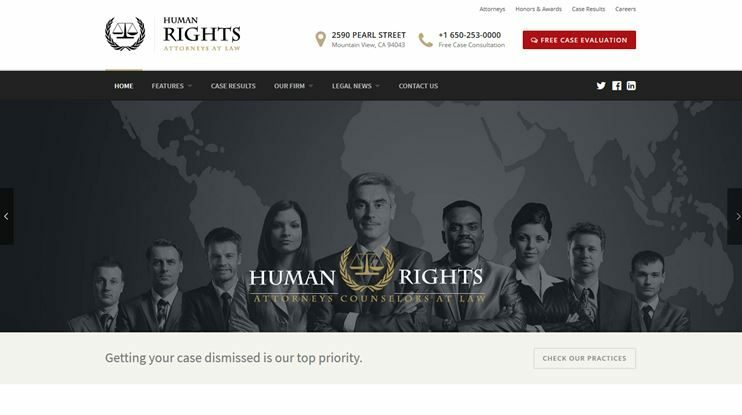 Human rights is a simple but dedicated lawyer WordPress theme. It is a responsive and retina ready theme for lawyers, law firms, attorneys and legal offices. With the included Visual Composer plugin, you can create pages with drag and drop elements. Slider revolution also comes included with it. With the Human rights theme, you get a case evaluation form too. The theme comes with an advanced theme options panel. With this options, you can easily customize the theme. With human rights, you can create a website in any language. Human rights is translation and multilingual ready. Law office is an attorney's WordPress theme for creating a personal or business firm's website. You can use the theme for creating a website for attorneys, barristers, advocates, etc. This theme can be used for creating a website for any law-related business. It is a performance-optimized and SEO friendly theme. With the visual composer, you can create page layouts of your choice easily. It has a facility to let the viewers book an appointment online. This is made possible by the WP Booking calendar plugin. The theme has flex slider and revolution slider included. For ease of use of the visitors, it has a Ajax search panel. With Law Office, there is a number of blog and portfolio options. Law office is highly customizable and comes with a number of features and customization options. Law office is WooCommerce compatible with the e-commerce facilities. 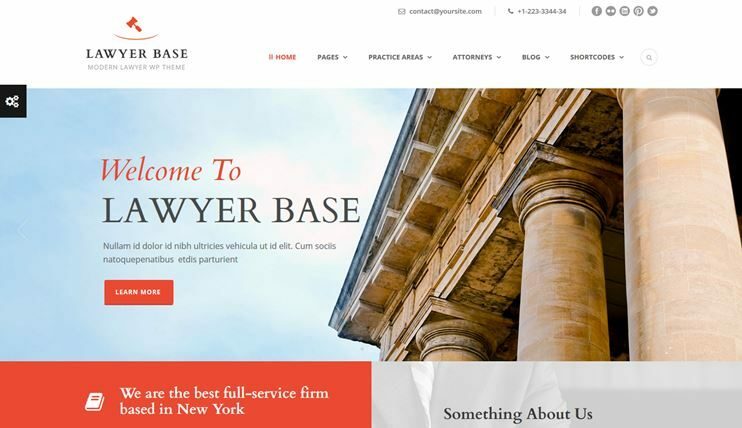 Lawyer base is an elegant and beautiful law company WordPress theme. It is ideal for law business website, or private lawyer's or advocate's website in 2018. It lets you choose from the full width or boxed layout. You can choose from the boxed or fullwidth layout of the theme. It comes with GoodLayers page builder to let you create pages with drag and drop options. The abundant theme features can be managed by easy options available at the backend. Lawyer base is also compatible with the WooCommerce add-on for the eCommerce features. With the theme, you have a dedicated post type for displaying the attorneys. It also displays the practice areas with a beautiful and intuitive layout. It is multilingual ready. With the live customizer, you can easily customize the theme. You can use the portfolio post type to display your business details. With the included Visual Composer included, you can create pages of your choice. The theme also comes with a blank page template. You can use this for maintenance mode, coming soon page or as a promotion page. To make the site look more interactive, you can use the Font Awesome icons. 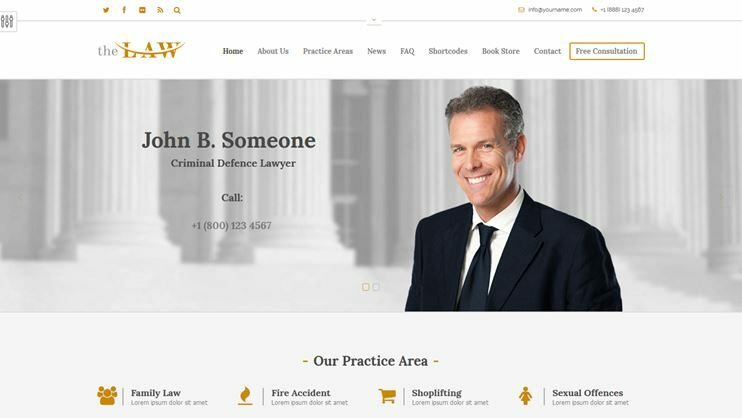 Law practice is simple WordPress theme that you can use to create a website for legal offices, private attorneys, lawyers, or a law firm. The theme has the facility to manage everything with easy options. Tell people about yourself, your work areas and ideas using this amazing theme. Express yourself, display your practice areas, etc. using Law practice. It comes with beautiful parallax sections, sliders and element animations. Law practice has a very professional design. It allows you to post information using the innumerable blog and portfolio layouts. The code of the theme is clear and extendible. With the options available or by changing the code, you can make the theme work the way you want. 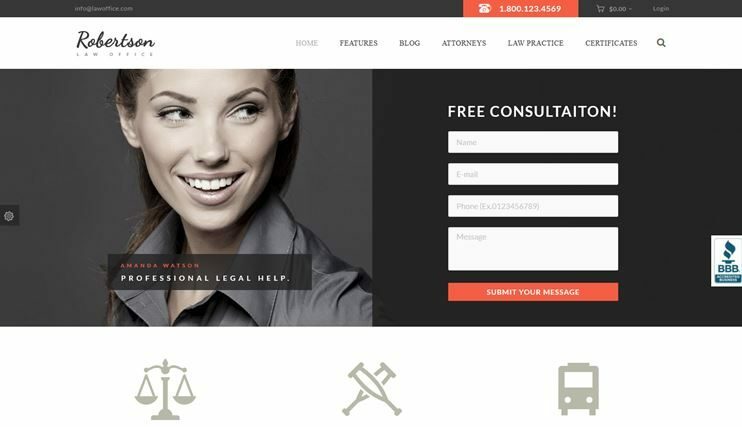 Lex is one of the lawyer WordPress themes to let you create a website for a lawyer or a law firm. Lex is responsive and retina ready. It is lightweight and performs faster on any device. Lex has some custom post types and widgets that are suitable to a law website. With Lex you have practice areas and case result areas. There also are, a number of shortcodes to be used in the theme. Create sidebars with the drag and drop sidebar builder. Lex can be translated into the desired language or multiple languages. It is SEO ready too. 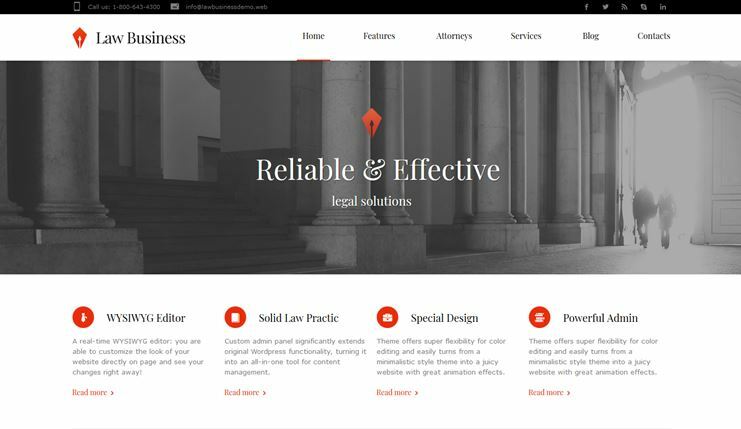 Law business is one of the premium lawyer WordPress themes of 2018. With law business, you can present your legal services on the website very easily. The form builder will allow you to create custom forms very easily. With the drag and drop content manager, you can manage the content very easily. The Law business theme is SEO optimized. The inbuilt layer slider and revolution slider, you can create and manage the sliders easily. The custom admin panel allows making the changes in the theme effectively. For further content, you can use the available shortcodes. 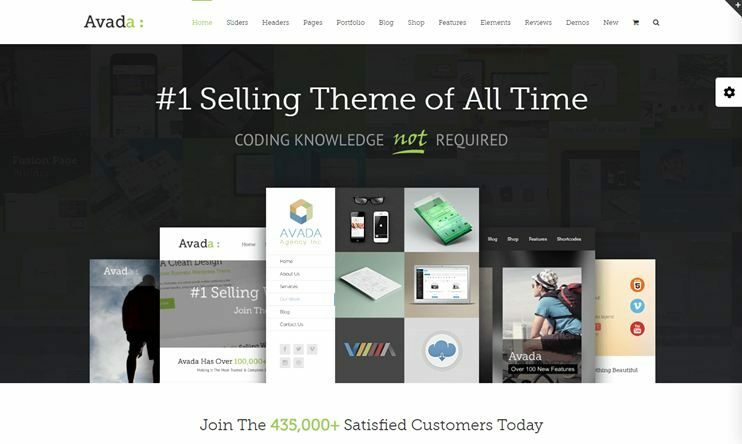 Avada is a multipurpose theme that can serve as a law business WordPress theme. It has plenty of features and demo versions to choose from. One of the demos is Avada Law. All you need to do is import the Avada law demo and get started with your law business website. With Avada along with fusion core plugin, you have unlimited customization options. It has the fusion builder tool. This tool will let you create pages by dragging and dropping page elements. Customization the theme can be very easy using the powerful theme options. It is compatible with most of the popular WP plugins. Avada is also compatible with the eCommerce plugin WooCommerce for online sales. It is SEO friendly too. 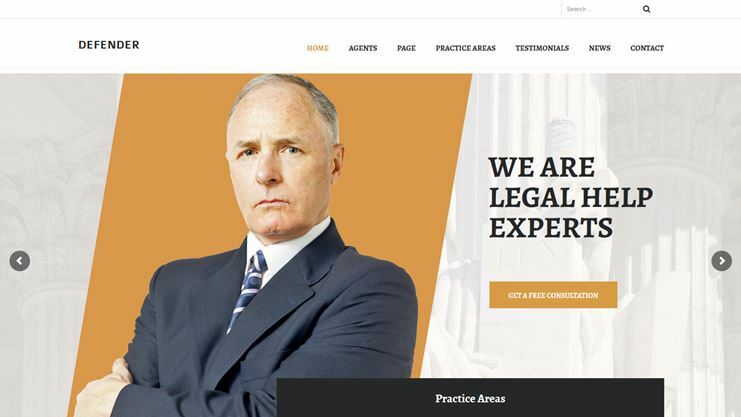 The law is one of the best lawyer WordPress themes. You can use this theme to create any website based on law. This theme is SEO optimized. It comes with Visual composer included. So create pages with drag and drop page builder. The theme is compatible with WooCommerce for integrating eCommerce features in the site. You can choose from the 12 header styles or the 7 available slider options. You also have a maintenance mode in the theme. With the law theme, you have plenty of customization options and page templates. 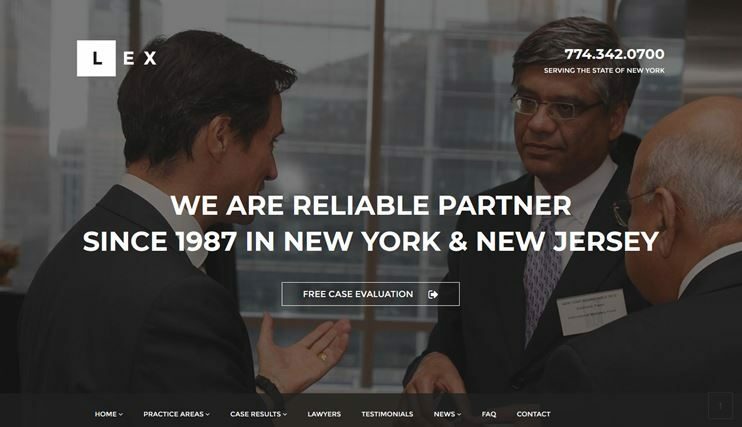 The attorney is a lawyer company WordPress theme. It is a simple theme with useful features and lots of customization options. Attorney lets you easily define the color scheme for your law website in 2018. The theme lets you choose from the three available portfolio options. With the Attorney theme, you have an advanced about page. So, you can display your information easily. The attorney comes with Revolution slider included. There are amazing theme options, you can easily customize the theme. The code of the theme is clean and has comments whenever required. So, for advanced customizations, you can use it. Themis is one of the best WordPress themes for law business websites. 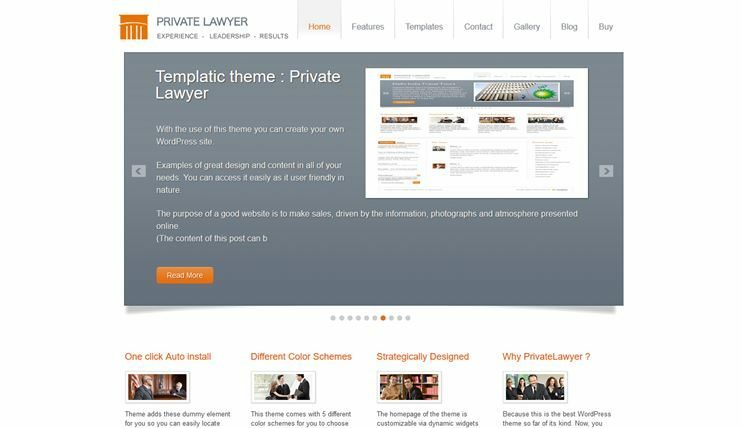 With this theme, you can create a website for lawyers, attorneys, or law consultants. You can also use Themis for creating a business website for a law firm. Themis has multiple theme options in the options panel. So you can customize the theme very easily. You also have multiple sidebar and menu options. You can choose the suitable layout from the 20 predefined page layouts.It comes with a shortcode manager and 30+ shortcodes. The theme is translation and multilingual ready. 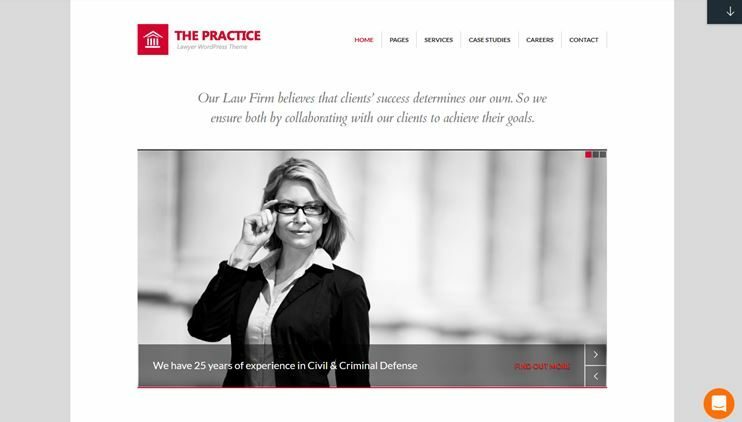 The Practice from themefuse is a practicing lawyer WordPress theme. It can be used for law person websites or a website for law-related firms. It is a responsive and retina ready theme. It comes with built-in page layouts that you can use instantly. To make your site look the way you plan, you can set the desired slider and background image. The practice is built upon the very flexible fuse framework. With The practice, you have abundant shortcodes. The practice has an SEO module included that helps you take care of the SEO factors. 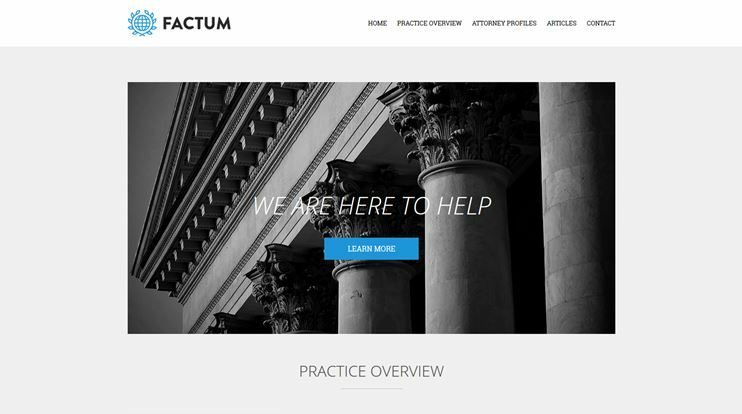 Factum is one of the simple and focused lawyer WordPress themes. 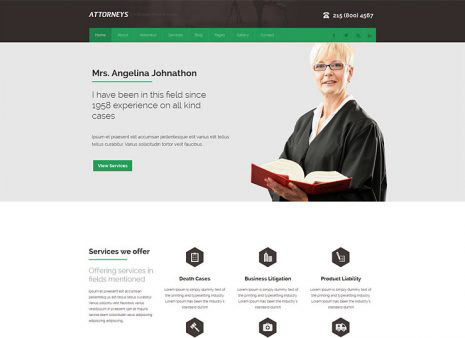 You can use this theme to create a website for law officials, lawyers, attorneys, advocates or legal offices, law firms, and law consultancies. The comprehensive homepage of the theme allows you to display all the important information. So, your visitors get a trailer of what you do. Factum consists of some custom widgets you can use for additional features in the theme. Moreover, it is SEO optimized. For your legal website's requirement, the theme has custom post types. With these post types you can display your services, team, clients, and testimonials. Factum is translation ready and speed optimized. Customizing the theme is very easy using the comprehensive admin options. 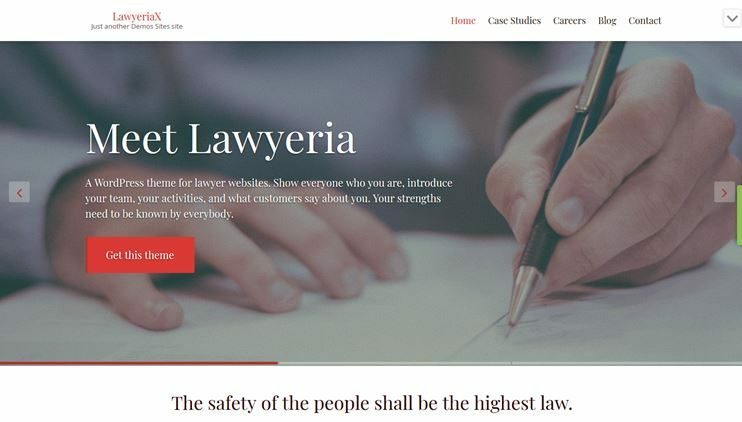 LawyeriaX is one of the lawyer WordPress themes, that lets you create a law business website with very easy options. You can use this theme for any law related website. Be it a website for a private lawyer/attorney or any law person, or a law firm's business website, this theme is perfect. LawyeriaX lets you create your website content with drag and drop options. You need not spend days creating your content. Everything just gets faster and easier. The theme is SEO optimized to ensure the search engine's ranks. The customizations in LawyeriaX can be done using the Live customizer. You can view the changes made instantly and decide better with this tool. Moreover, the theme has a great compatibility. The Defender is a clean WordPress theme for creating a website for lawyers or attorneys. 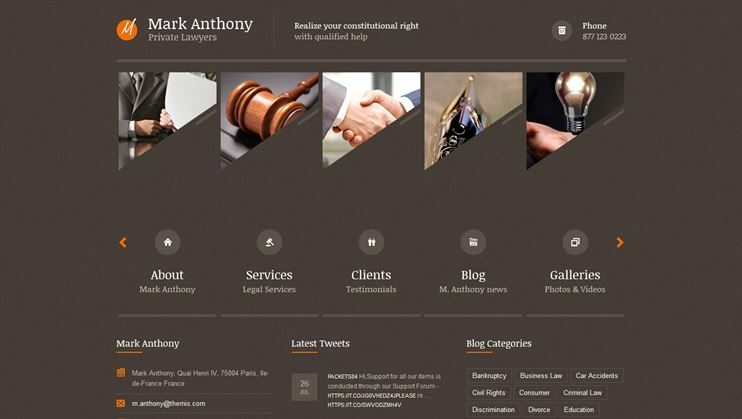 This theme can be used for almost any law-related professional website. Defender is totally responsive. The theme offers you the facility of online appointment booking. This is harnessed by the Booked plugin included in Defender. Defender is compatible with WPML, you can create a multilingual website very easily. For further enhancements, the theme comes with custom post types and widgets. 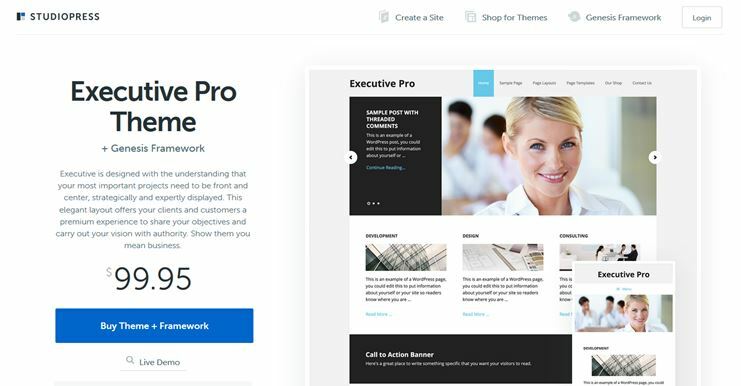 Executive Pro Theme is a private lawyer WordPress theme. The theme is designed to showcase the skills and portfolio of a business executive such as a lawyer or an advocate or Judge. Executive pro focuses on the content. It makes sure that your ideas, vision and work is properly conveyed through the website's content. With this theme, you have custom page templates, and 3 layout options. With the advanced and powerful theme options, you can easily customize the theme. The header and background can be set as per your requirements. The various widgets on the homepage lets you change the homepage's layout and recreate it completely. With these amazing lawyer WordPress themes, all you'll need to do is to grab a theme that best suits you and start customizing it. You'll end up with a beautiful, purposeful and manageable website of your own. 2018 is the year when you want to make your online presence felt. Pick up a theme and start with your law business website now! The demo is working fine for me. Please try after clearing your browser cache or try using different browser. I’m sure this will help you. Let me know if you need any further assistance. Nice list. Because of this post I have found unseen themes that I really liked! Which are those unseen themes? Did you manage to find the right template for you? If yes, which one did you choose and why? Let me know if any assistance needed. 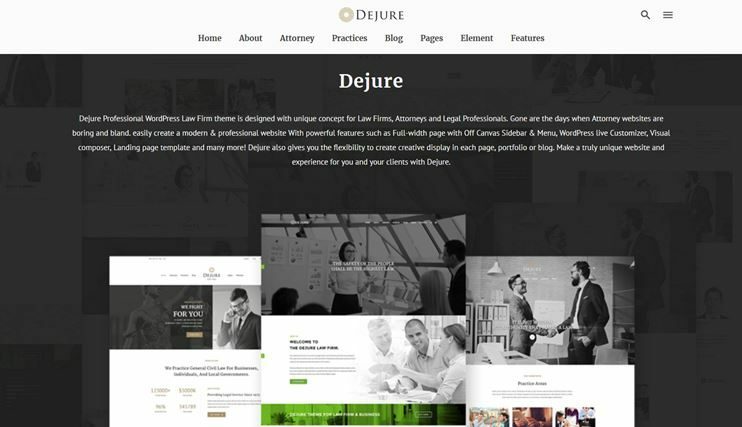 Thanks for sharing, these are best Lawyer WordPress themes. Excellent collection.Watch all your theme very nice.Best selling wordpress theme collect to your.